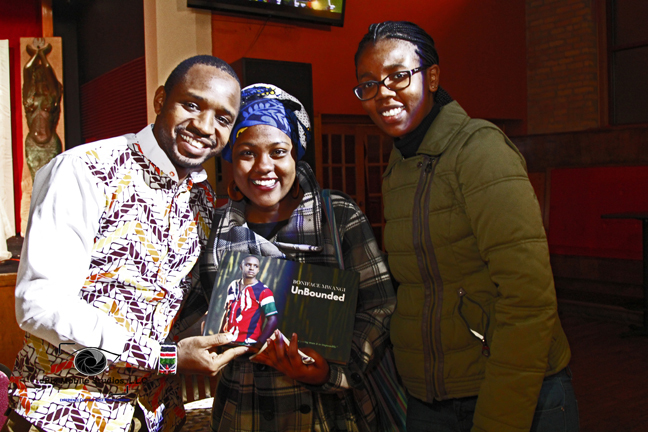 Kenya’s renowned photojournalist and human rights activist, Boniface Mwangi, told a friendly and diverse group of Kenyans in Minnesota a sobering reality they might not have fully considered. The country, he said, was on course to move from leadership based on tribal kingpins to one ruled by criminal leaders and cartels. For evidence, he offered Mombasa governor Hassan Joho and Nairobi senator Mike Sonko as perfect examples. He said the transition will happen as soon as this year’s national elections due to be held in August. Mombasa governor Joho, who is also the main opposition party’s deputy leader has not been able to overcome the portrait of one involved in the narcotics trade dating back to 2010 when a report was tabled in parliament by the country’s security minister implicating him and five other members of parliament. Joho was at the time a member of parliament. He was ultimately cleared but the image has stuck, as it has for Nairobi senator Mike Sonko. 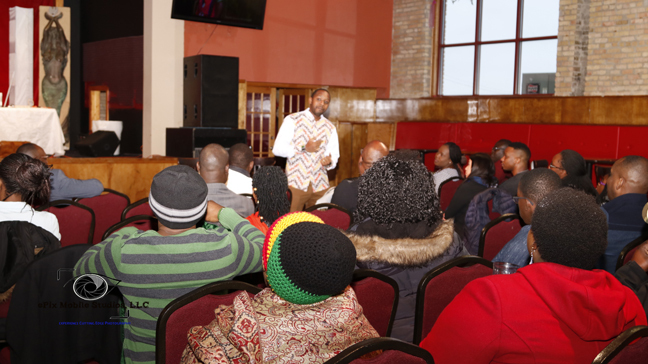 Mwangi, a persistent critic of his country’s leaders for their corruption and ineffectual leadership, was in Minneapolis on Sunday for the US launch of his autobiography, Unbounded. 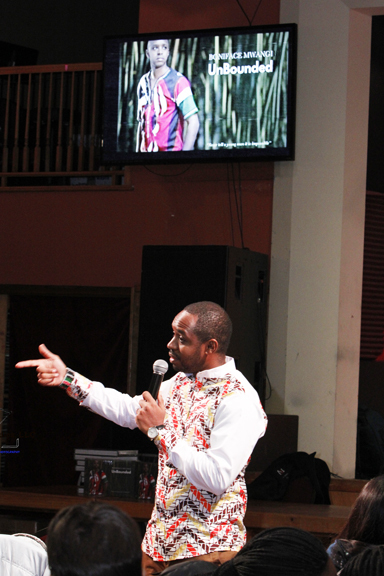 The autobiography was launched officially in Nairobi last November. “I believe this is the last time we are having elections based on tribe,” he said. He also offered for evidence former presidential candidate Peter Kenneth who many Kenyans had banked on to transcend tribe, as an example of the challenge the country faces in finding leaders who can truly overcome the tribal considerations that are common in the country’s politics. “There is now talk that Peter Kenneth is looking to take over the mantle from Uhuru Kenyatta as the Kikuyu leader after 2022,” Mwangi said. The Kikuyu are the largest tribe in Kenya and the community the current president of Kenya (Kenyatta) hails. 2022 refers to when Kenyatta leaves office if he is able to win a second term in this year’s August elections. The photojournalist who counts Malcolm X and Thomas Sankara as role models for inspiration said Kenyans as an electorate have mental blocks that are preventing them from holding their leaders accountable. “Until Kenyans decide that they will not continue to compensate their leaders at first world levels but receiving third world services in return, this will continue,” Mwangi said. Kenyan legislators are among the world’s highest paid politicians surpassing even some developed countries. Mwangi is currently involved in a defamation lawsuit filed against him by the country’s deputy president, William Ruto. Ruto sued following a tweet Mwangi sent out on September 28 accusing him of corruption, murder and land grabbing. Those attending the launch and signing on Sunday expressed fears for his safety, given the country’s history of assassinations of the system’s prominent critics. “Is your family safe,” one attendant asked. He declined to offer the whereabouts of his family as “some of you are NIS (National Intelligence Services),” eliciting nervous laughter. There is widespread belief among the US Kenyan diaspora that Kenya’s NIS has agents living within them especially in areas with many Kenyans like Boston, Minnesota, Texas, DC area and New Jersey. Many Kenyans in these areas believe the practice of planting NIS agents within the diaspora started with the authoritarian regime of Daniel Arap Moi when diaspora political activism was at its peak. Lupita Nyong’o was born in Mexico because his father, a political activist at the time, fled for his safety from Moi. Mwangi assured the gathering that he has taken measures for his safety which includes not staying out late. Those gathered still seemed unconvinced so one lady asked him if he was practicing “self care”, by attending to his mental and health wellbeing as he goes about his activism. “You rest and you die,” he answered to put to rest questions about his safety. If Mwangi was in top form in spelling out the ills of Kenya’s ruling elite, he did not spare the diaspora either. He told them to their face on Sunday to stop “ujinga wa ukabila (the stupidity of tribalism)” saying it was holding back the diaspora in making it a powerful force in bringing about change in Kenya. 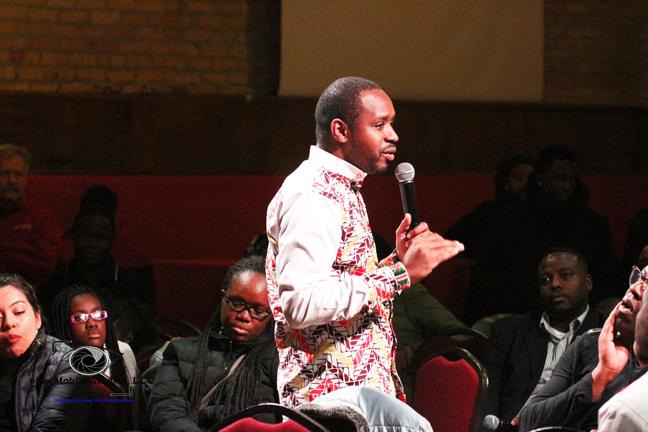 Diaspora Kenyans in the US are known to organize along tribal lines, which has stymied efforts to deal even with local immigrant specific issues that affect all of them. He shared how during his current visit members of his Kikuyu tribe in the United States have been accosting him and excoriating him on being hard on the president. “I have had opportunities to sell out but I have no price,” he said in response to whether like Peter Kenneth he will also eventually go back to his tribal cocoon. Mwangi is also a candidate for parliament in the cosmopolitan Starehe constituency in Nairobi. Asked why he is confining himself to running for “just a parliamentary seat” and not the presidency, he said he needs to get the people’s trust first by vying for smaller office. He urged those present to make an impact where they find themselves and not wait until they are in high office. He described those as some of the values his grandmother who he described as an inspiration taught him. On the upcoming August elections, Mwangi revealed he plans to not vote for president if there is no third party candidate “I will vote for all the other offices on the ballot but skip the presidency” if only Raila Odinga and Uhuru Kenyatta are the two choices. His autobiography, which is a collection of his personal story and a showcase of some his award-winning work over the years, is available on Amazon. 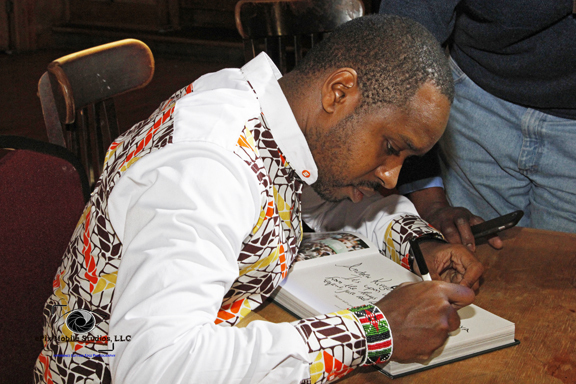 Related: Boniface Mwangi scheduled for his autobiography launch in Minneapolis.